Priced at around $100-$150, the KitchenAid 5 Speed Blender is widely recognized for possessing a great deal of power and functionality. Its versatility comes mainly from the built in Intelli Electronic speed sensor which controls and modifies settings. This helps to maintain a good and even speed, matching the thickness of the ingredients you are blending. Something that many users of the Kitchenaid 5 speed blender like to point out, myself included, is that this unit is incredibly reliable and can make pretty much every blender recipe that you require. It can certainly create wonderful dips, salsa and other sauces. It can mix frozen beverages and is great for blending up a nice pot of soup. In fact it possesses all the power that an average kitchen would need from a blender. So, What Are These 5 Speed Settings and How Well Do They Work? Working with this appliance is generally quite simple, with the clearly named control buttons you’ll find adequate functions that help you perform each blending task… But not so many options that the whole blending process becomes perplexing. Stir –This is the slowest speed setting and its job is to stir rather than blend. We found that although it did stir, when you first switch it on it produces an initial blast that can send the food flying up as far as the lid before settling into its steady, stirring rhythm. Mix – This was excellent at mixing batters and salad dressings. Chop – This is particularly good used with the pulse button to create crumb and crunch type toppings along with cold salads and meats to make sandwich fillings. More than happy with the results here! Puree – Good for soups and baby foods, although you will need to make up a few portions here as this is a large pitcher. Liquefy – Usually the most used button and is best for all your frozen drinks, shakes and deserts. Liquefy on its own is comparable to most mid range home blenders, but when you add in the pulse mode (although fairly noisy) it does do a very good job and is potentially punching above its price tag here. Crush Ice – The ice is crushed using a staggered pulse rhythm, it was a bit on the noisy side but apart from that we had no problem with this and we are happy with its result. Pulse Mode – To be used as an extra boost of power to all of the above speeds. Update: There’s really only one model to choose from now, the KitchenAid KSB1570 comes in several colors and is averaging 4.5 stars overall from more than 500 reviews. Choosing which KitchenAid 5 Speed blender is a little taxing as there are 3 available designs and lots of neat colors to choose from. Several visitors to this page have asked me to explain what the difference is between the Classic Series (KSB560), the Custom Metallic Series (KHB580) and the Artisan Series (KSB565). I’ll try to make it as clear as possible. All 3 of these KitchenAid 5 Speed blenders have the same speed, power, buttons and functions. And although their shape varies slightly, the only real difference is the paint finish, the jug size and whether its glass or polycarbonate. Most importantly the Artisan blender series doesn’t perform as well as the Classic or the Metallic Series and isn’t worthy of being featured on the best blender page here at BlenderExpert.com. Comes with a BPA-Free shatterproof polycarbonate 56 oz pitcher and is available in a whopping 12 colors! Look out for the pale pink ‘Cook for Cure’ in this model. Exact same spec blender as the Classic above. The only difference is that you pay a little extra for the metallic finish in either Brushed Nickle or Chrome. Here’s where the 5 speed blender becomes very different. With this model you get the same spec blender as the Classic above with many color choices. But in place of the 56 oz polycarbonate pitcher is a 48-Oz glass pitcher. I cannot recommend the Kitchenaid Artisan blender and I am excluding it from what is a fairly positive review. It is definitely not on my recommend list and seems to be fraught with leaking and coupling issues. As the Artisan is the only model that comes with a glass pitcher, it’s fairly identifiable and I would strongly recommend you give this one a miss. The motor unit with this blender features 0.9 horse power, so it pretty much handled everything that we placed in it. But you don’t need to just take our word for it as the 5 speed Kitchenaid blender has been around for a few years now and there’s no shortage of consumers who’ve described how it effortlessly shaved ice and mashed peanut butter, along with many other difficult or gluey food stuffs. 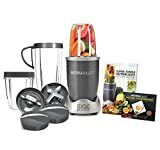 The quality of this blender is demonstrated when you learn how it’s constructed from metal parts and not plastic, and how the electric motor shifts whenever it is straining. If you like to mix a great deal of foodstuff or fluids at one time, the larger jug supplied with this blender is going to be a terrific benefit. It will hold fifty six ounces and is manufactured from a resilient polycarbonate material. In addition to this, it comes with a smooth grip handle to help with lifting and holding. The KitchenAid 5 Speed blender is also manufactured in numerous colors, which makes it simple to find the best one to complement any cooking area. Black and Red Kitchenaid 5 speed blenders would be the most in-demand right now. A typical criticism of this blender is that it’s quite heavy. At almost twelve pounds it’s true that it can be seen as a little on the heavy side. So, whilst its solid build is a benefit for most people, the extra weight is a concern for some individuals. Even though it is quite sturdy, depending on the quantity and texture of the food in the jar it can vibrate quite wildly on the kitchen surface. Among probably the most frequent technical issue users have found with this blender is that the base of the jug starts leaking a little. Thankfully, KitchenAid have now redesigned their jar and are actually offering to replace any leaky ones for free! That’s an example of the fantastic customer service we come to expect from such a big brand. Update: It appears that Kitchenaid are not replacing the older leaking jars anymore, this was the case at time of writing but I’m guessing things have moved on now. This is one of the best mid priced blenders on the matket but all jars will wear out over time and after a certain age Kitchenaid cannot be responsible for replacements. So unless your warranty is current they will not replace it. The KitchenAid 5 Speed blender is highly recommended by consumers. They like its long lifespan and ability to make just about any chopped or blended recipe. Over the years it has stood the test of time and has received thousands of five star ratings on Amazon. This blender dwarfs all other blenders in its class, the new KitchenAid KSB1570SL is averaging 4.5 stars overall from more than 500 reviews. I see this quality blender as the best value for money under $150. It’s highly recommended by a lot of consumers that are providing rave reviews. It comes in a wide variety of colors, making it easy to find the right one to match any kitchen. And the construction is incredibly durable, which means you won’t need to be replacing your blender any time soon. is there a way to get a replacement at no charge ? My husband bought a new blender and I used it only a couple times and it leaks badly. Model number is KSB5650B0. Serial number is W01271417. It doesn’t matter how I clean it or put it back together it leaks and is so frustrating. Same with me….only 1 year warranty and $49 to replace the leaky container, yikes! You would think they would at least sell them to you cheaper! I just got done talking with KitchenAid and I got the same response regarding my leaky blender pitcher. My warranty is up and no free replacement of parts. They stated that there are no known defective parts for this blender. I referenced this article and even quoted the portion where the article mentioned a redesign, free replacement and great customer service. They said there was never a redesign of the pitcher. They said they have no control over what other’s write as the site is not through KitchenAid. I definitely will not spend $50 to replace a faulty pitcher that KitchenAid claims was never faulty in the first place even though it seems multiple people are having the exact same issue. I guess that all warranties have now expired since the leaking problems and the fix, so they’ve stopped the offer. They cant be held responsible after the stated warranty otherwise they would be replacing all blenders in to next century ;-). Remember, this is a mid priced blender and as such is not built to last forever. I bought a Diamond jar series because of the KitchenAid name. Probably started leaking within months but I didn’t react quick enough because my wife was the primary user. Since I’ve started using it 2 times a day the reality has set in that is a mfg problem and there should have been a recall. We paid over $150.cdn for it and now KitchenAid Canada wants $80.oo for a new jar. I know we bought it in 2013 but what an insult to the customers. We are looking to buy a new fridge now and will be steering way, way away from KA or anything else they own or produce. Very, extremely disappointed!! Thank you very much for an insightful/informative review. My decision making is much easier when someone can offer the true differences not only based on manufacture detail but practical. Shalom. You do not point out that this KitchenAid blender is one of the very few where you can’t replace the blade or seal separately. As a result, what is a $5 repair to an Oster or many other brand blenders costs $50+ here. And if it only wore out/started leaking after 5 or so years of use, then maybe that might be worth it if there is some technical benefit of the non-replaceable blade. But 30% of the reviews on Amazon are complaining about having to replace the jar multiple times within 2 years. That’s junk level durability. What’s especially puzzling about this is the blender itself seems like it should last a lifetime. The blade is much thicker and more durable than the Oster. And the motor feels like it could power a bench grinder. But they can’t design a jar with a seal that doesn’t start leaking, or give the buyer a way to replace just the seal? KitchenAid needs to go back to the drawing board and re-engineer a compatible jar for all the blenders already out there that has a reasonable service life. I would gladly pay for it because this is a great blender when it isn’t leaking. Stonewalling customers with the standard ‘nobody else is having this problem’ nonsense is really tarnishing the brand. And yes, I have a KSB-560, and yes it is leaking. Anyone for a class-action lawsuit?